Strathmore Briquette, sells and delivers eco briquettes, hardwood and larch logs across mainland UK. We also sell easy to light kindling to get your fire going and rock salt to keep your pavements clear all winter. Our wood products are ideal for wood-burning stoves, open fires and chimeneas in different sizes - and you can buy logs online, too. Did you know that burning wood with a moisture content of 25% or more is not cost effective? This is because a very high percentage of the heat generated is used to dry out the excess moisture in the wood, rather than heat your home. The drier the wood, the more cost-effective, and the more heat produced for you. Our briquettes have a GUARANTEED low moisture content! This means you get a regular and almost immediate heat. But if you prefer to buy logs online rather than briquettes, Strathmore Briquette stocks larch logs, hardwood and kindling. 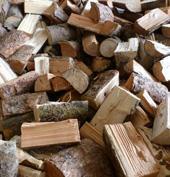 All our firewood is processed on site at Douglastown. Make the most of our flat-rate charge of £10 for deliveries of briquettes, kindling and rock salt to addresses within 15 miles of Douglastown (by Forfar, Scotland) so stock up now! 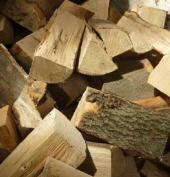 We've also got great deals on our delivered bulk bags of wood as well as on our combination packs of wood and kindling. And there's no extra charge to pick up your order directly from us. Don't wait until the winter: buy logs online, stock up your kindling and lay down your rock salt now with Strathmore Briquette! 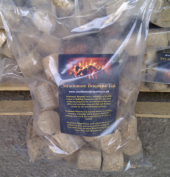 Strathmore Briquette, sells and delivers eco briquettes, hardwood and larch logs across mainland UK. We also sell easy to light kindling to get your fire going and rock salt to keep your pavements clear all winter.